Yes, God did for these Innocents, who were immolated on his Son’s account, what he is doing every moment now by the sacrament fo regeneration, in the case of children who die before coming to the use of reason. We, who have been baptized by water, should be all the more ready to honor these Little Ones, who were baptized in their own blood, and thereby associated to all the mysteries of the Divine Infancy. We ought, together with the Church, to congratulate them, for that a glorious and premature death secured them their innocence. They have lived upon our earth, and yet it defiled them not! Truly, these tender Lambs deserve to be forever with the Lamb of God! May this same earth of ours, grown old in wickedness, draw down the divine mercy on itself, by the love and honor it gives, each year, to these sweet Children of Bethlehem, who, like the Dove of Noah’s Ark, could not find whereon to rest their feet. In the Collect, the Church prays that her children may confess, by their works, their faith in Christ. 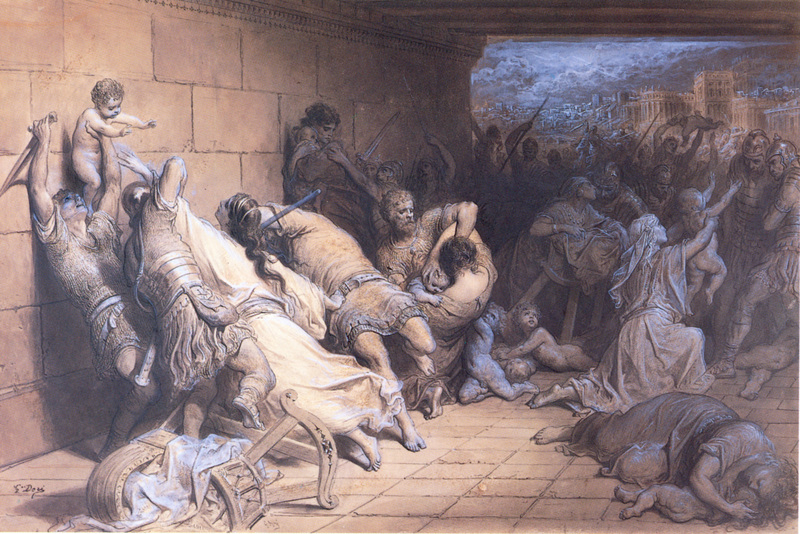 The Holy Innocents give their testimony—the only one in their power—of suffering for their divine Master: but the Christian, who has attained the use uf reason has more to do than suffer for his faith—he must confess it before Persecutors and Tyrants when they bid him deny it, and also before that more permanent tribunal of the world and his own passions. No man has received the glorious character of a Christian, on the condition that he should never own himself one. Lectio libri Aposcalypsis beati Joannis Apostoli. Lesson from the book of the Apocalypse of Saint John the Apostle. ℣. The snare is broken, and we are delivered: our help is in the name of the Lord, who hade heaven and earth. A voice in Rama ws heard, lamentation and great mourning: Rachel bewailing her children, and would not be comforted, because they are not. And, lastely, O ye Innocent Lambs, slain for Jesus, and following him whithersoever he goeth, because ye are pure—pray for us to the Lamb of God, that he permit us to come to him in Bethlehem, and, like you, fix our dwelling there, for it is the abode of love and innocence. Speak for us to Mary, a Mother more compassionate than Rachel; tell her that we are her Children, and your Brethren. She that compassionated your momentary sufferings, will pity us and help us in our long years of temptation, pain, and sorrow.